Americans run from fat like the Japanese fleeing from Godzilla. Lowering fat intake robs our bodies of essential nutrients, counterintuitively piles on pounds, and increases risk of disease. Saturated fats are slandered for their role in disease, while many healthy native cultures consume them abundantly relative to the standard American diet. The common usage of the English language doesn’t help by using one word – fat – to describe both the macronutrient fat (i.e. like protein and carbs) and the fat body type (i.e. you’re fat, not skinny). With this language flaw we incorrectly associate fat the macronutrient with fat the body type. Eat more fat. Change your mental model that associates ‘Fat the Macronutrient’ with ‘Fat the Body Type’. Replace ‘Fat the Macronutrient’ with Lipids in your every day language. Eat more fat overall, more saturated fat, and less sugar and carbs. Notice your energy levels and mood stabilize, your health markers improve, and your hunger subside. Fat will dance on your tongue as you enjoy food that tastes good again instead of dry, processed, sugar-laden, evil food imposters. I was a lean, mean, fighting-machine, but my blood sugars swung wildly on a roller coast ride each day. I trained like a madman for several hours per day – running, weight training, jump rope, sparring, heavy bag, speed bag. I ate a classic “healthy” Western diet – lots of carbs, plenty of protein, and minimal fat. The amount of chicken breast I ate was sickening. Boneless, skinless chicken breast tastes awful. I know that now. It was standard fare back then. I’d mask the bland taste of chicken breast with a barbecue sauce pumped with sugar. My standard operating procedure was to substitute fat and flavor for sugar and cravings for more food. From an outsider’s perspective I was healthy. We confuse being lean or being fit or athletic with being healthy. You can be lean, fit, and athletic AND unhealthy. There are many markers of health. Weight, body type, and physical performance are a few of many health indicators. Inside I was unhealthy in the way that matters most to me. My blood sugars shot up and fell down every 3 hours like clockwork day after day. My average blood sugar reading (HBa1c) was good, but my control wasn’t. Diabetics are measured by an HbA1c test. Under 6.0 and you’re not considered diabetic. Under 7.0 and you’re a controlled diabetic. Over 7.0 and you’re not controlled. Unfortunately, it really doesn’t measure control. It measures an average over a 2-3 month period. If you have a low blood sugar of 60 for 1/2 your day and a high blood sugar of 180 for 1/2 your day, your average would be 120 which is relatively good for a diabetic. However, your whole day is spent high or low and that’s not healthy. Most diabetics test their blood sugar 1-10 times per day. When I started using a continuous glucose monitor I received 288 measurements per day. Before I was blind and now I could see the effect that each of my food choices had on my blood sugar. My blood sugar fluctuated proportional to the amount of carbs I ate as you can see in Chart 1 below. 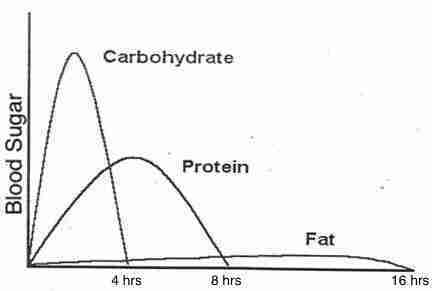 This graph shows a simplified version of how your blood sugar responds to increasing amounts of carbohydrates in your food. From monitoring my food intake and blood sugar response, I saw that it didn’t matter whether the carbs had a lot of sugar or fiber, simple or complex, processed or not. Eating whole grains didn’t limit blood sugar spikes much compared to eating refined grains. This led me to a conclusion: I need to reduce the amount of carbs I eat daily. Chart 1. Reference – Matt Dever, 2016, mattdever.com. To maintain the same weight I needed to replace those carbs with fat or protein. I was already eating a lot of protein and eating more would tax my digestive system even more. At the same time I was learning the impact of all carbs on my blood sugar, I was reading that fat wasn’t really all that bad for you. In Real Food you learn about many cultures that eat massive amounts of saturated fat and still have low rates of heart disease, diabetes, and obesity compared to cultures with Western diets. A heart surgeon with over 25 years experience and 5,000 heart surgeries explains that disease is caused by inflammation, not simply excess cholesterol at this link. The foods we eat cause small injuries that look like someone scrubbed a brush against your arterial walls. The body responds to these injuries with inflammation to protect against the injuries. This is harmful when it happens every day multiple times per day. Chronic Inflammation is caused by spiking blood sugars multiple times per day from eating too much sugar and refined flour in processed foods. 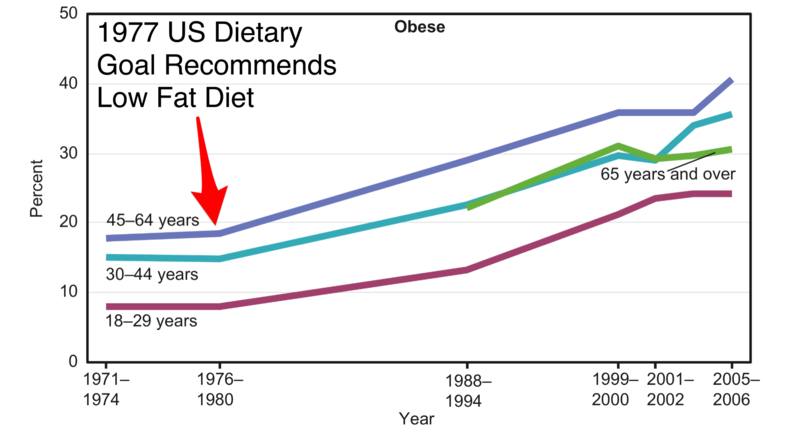 Plus, the obesity epidemic in the US started around the same time a government committee published US dietary guidelines recommending a low-fat diet as shown in Chart 2 below. Chart 2 – US Obesity Graph from 1971 to 2006. Reference – National Center for Health Statistics (US). Health, United Status, 2008. National Center for Health Statistics Health, United States, 2008. With Chartbrook, Hyattsville, MD: 2009. Based on these influences, I experimented with eating more fat. My HDL, LDL, and Triglyceride levels were excellent before I ate a lot of fat and stayed excellent after I increased total fat and saturated fat significantly. The American Heart Association recommends getting 5% of your calories from saturated fat if you’d benefit from lowering LDL, which is equal to 11 g of fat for a 2000 calorie per day diet or 16 – 22g for someone like me eating 3000 – 4000 calories per day. I’m eating three times as much saturated fat as recommended, but still have excellent cholesterol and tryglyceride levels. The total fat intake noted about is about 700 calories, which doesn’t include other sources of fat besides saturated fat that I eat regularly like olive oil, nuts, nut butters, and avocados. I’d estimate that’s another 90 g for a total of 180 g of fat daily and 1600 calories. Roughly 50% of my daily calories come from fat. That’s different from many people in the US who follow the advice born from those 1970s government guidelines to eat low-fat and consequently higher carbs. Those guidelines likely launched us on a path towards more obesity and diabetes. While my fat-heavy diet isn’t normal, it mitigates negative effects from diabetes and lowers my risk for other diseases. Rehab your relationship with fat to kickstart your journey towards the pot of gold at the end of the “Eating More Fat Rainbow”. You may not get these benefits immediately, since we’re taking baby steps to make it easier to get started. When eating more fat with the habit below is automatic, you can increase your intake of fat even further to get more of these benefits. If you have questions on how to do that, email me. Decrease Hunger Cravings and Lose Weight – Eating a lower amount of carbs in your diet leads to less insulin in your system, since insulin is needed to mitigate the blood sugar spike you see in the plot line for carbohydrates in Chart 3 below. 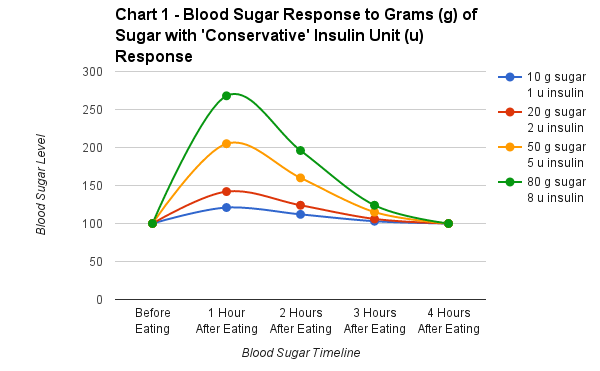 Less insulin in your system reduces the frequency of hunger cravings every 2-3 hours during insulin’s peak action. These hunger cravings occur when your blood sugar drops quickly as you can see on the ‘Carbohydrate’ plot line. Conversely, fat raises blood sugar minimally reducing the vicious cycle of hunger. Less hunger cravings provides an opportunity to eat less and lose weight. Benefit Delay – It may take some time to realize this benefit, since you’re replacing carbs with fat and may be eating at the same frequency at first. You may also have a strong urge for carbs as you reset your palette and system. As your body adjusts to eating more fat and your cravings for carbs and sugar diminish, you can choose to reduce your eating frequency to lose weight. Sugar Detox Challenges – Detoxing from sugar is hard. If you struggle with this, email me and I have a rough chapter on Eating Less Sugar I can send you and we can discuss strategies to make this easier. Don’t beat yourself up if you give in to your cravings. Acknowledge it, consider whether to change your habit change strategy, decide whether to change, and move on to the next day of experimenting. Add Muscle – Fats are needed for proper cell functioning, vitamin absorption, and brain and nerve function all of which can aid in muscle-building efforts. Restricting carbs while eating high-fat can is a natural way to increase growth hormone levels. Fat is also dense energy source for eating excess calories when planning to add weight through muscle gain (Poliquin Group). Depression – Studies show higher fat diets improving brain function, mood, and reducing depression symptoms. Reducing carbs and blood sugar swings reduces low blood sugars, which often makes people “hangry” (angry from hunger). Less sugar = less “hangry”. Cancer – Many cancers use sugar as a primary fuel for growth which you can learn more about by reading about the Warburg effect (Warburg Wikipedia). Early research shows that limiting sugar and carb consumption can decrease cancer risk. Heart Disease – Saturated fat has been associated with increased heart disease risk, but research indicates that saturated fat does not increase bad cholesterol (Tian). Saturated fat increases good cholesterol (HDL) and decreases tryglyceride levels more than a low carb diet (Tian). Research shows significant reduction in mortality and heart disease rates from eating higher amounts of saturated fat (Poliquin Group). Lower carbohydrate consumption and increased fat can stabilize blood sugar levels as noted and reduce blood pressure (Gunnars), another risk factor for heart disease. Fat does not make you fat. Remember, ‘Fat the Macronutrient’ is different from ‘Fat the Body Type’. Eating fat in your food does not make you more fat than eating carbs or protein. Eating excess food whether it’s carbs, protein, or fat can make you fat, but that’s a different model. When you’re thinking of the fat in your food, substitute the word ‘lipids’ for ‘fats’ to help you break the association for ‘Fat the Body Type’. Saturated Fat is NOT BAD for you. The normal American thinking on saturated fat is off. You can read books like Real Food or articles like the one mentioned from the heart surgeon for more details or try your own experiment. Use coconut oil. Eat your egg yolks and chicken with the skin on and bone in. If you regularly get your blood tested regularly, check key markers like HDL, LDL, and Tryglycerides from your last test results and a few months after eating more saturated fat. Embrace the taste. Eat breakfast with high-fat food and minimal sugar or processed carbs. Pick from the list below. Experiment – You may not be used to eating these foods in the morning, particularly without bread. This is the hard part. Experiment. Try a few combinations and learn what’s appealing to you. Efficiency – To save time on cooking eggs, preheat your pan for 10 minutes while continuing the rest of your morning routine so it only takes 2-3 minutes to cook them. Prepare guacamole or deviled eggs in batches for a few days of meals or snacks. Reward – Notice how you feel 2 hours after eating breakfast and how this compares to your previous morning routine. Set a timer on your phone if you need a reminder. Habit changes need rewards to be successful. Don’t underestimate how a simple timer and a moment of reflection can increase your chances for a successful habit change. If you previously ate grains or starches, you’ll feel more energetic, mentally sharper, and less hungry. Keep high-fat snacks at work. Nut Butters (Peanut, Almond, etc) – You can eat them with just a spoon. “But doesn’t fat make you fat?” No, it doesn’t. Read from the top again. Overeating anything can make you more fat. “Fat the Macronutrient” is no more likely to make you fat than carbs or protein. Fat fills you up and makes you less likely to overeat. “But I don’t like drinking whole milk, eating egg yolks, etc” Understood. That’s common for many people. Try incorporating 2% milk or 1/2 an egg yolk for a week. You may not like it initially, but often you’ll grow to like it relatively quickly with the right perspective. Keep an open mind for a week. Experiment. Mix full fat and half-fat versions until you can go all the way to full-fat, whole, etc. “But what if I’m already eating enough fat?” If you know you’re eating plenty of fat and a low amount of carbs, this change isn’t for you. Most people don’t need more than 150 grams of carbohydrates per day. I recommend eating more protein or fat and reducing carbohydrates if you’re above that level. This approach is not for everyone though. Athletes may prefer or need higher carbs. You may have other dietary constraints that make this more difficult. Assess your circumstances and if you’re not sure what to do, experiment with lower carbs and more fat. See how you feel after a month. Not a week. A month. You need time to acclimate to the change. If you’re feeling worse or the same, assess your circumstances again and evaluate whether this change is for you. If you’re feeling better, continue with more fats and less carbs. If you want to discuss strategies, results, or options, email me. More Challenges and Questions – Read this link from Mark Sisson for answers to more common questions on eating a high-fat diet. Food Shopping – This is where you win or lose with any eating habit. You must buy more fat. Prepare a standard list of foods with significant fat you can use as snacks each week. Pick a few proteins with fat like certain types of fish, eggs, and fattier meat for meals. You see a “Low-Fat” label – RUN! Okay, you don’t need to sprint, but turn and walk away. Don’t buy it. Look for a full-fat variety. If they don’t have something more substantial, don’t buy that food at all. Ask the store manager whether they can stock a full-fat variety or find another place to food shop. Kitchen – Enjoy cooking with butter, olive oil, coconut oil, etc. I’d avoid vegetable oils when possible, since they often lead to negative shifts in our Omega-6 to Omega-3 fatty acid ratios. Car – If you’re prone to hunger when traveling, keep some fat-based snack in the cars. Nuts are an easy choice, since they’re portable and non-perishable. Work – Keep fat-based snacks here too. Nuts, nut butters, olive oil, yogurt, guacamole, and deviled eggs are all good options. That sobering statement from Marcus Aurelius applies perfectly to our relationship with fat in our food. Much of what we’ve heard in the US over the last several decades about fat in our food is an opinion that led us to eat more carbs. More carbs can lead to diabetes, obesity, heart disease and many other bad outcomes. My opinion from research and personal experimentation is that eating a high fat diet is better for you. Less hunger and a more stable mood and energy levels are immediate benefits, while improved health markers like triglycerides and cholesterol can be seen in as little as a few months. Plus, eating more fat just makes you happier. Fat tastes better. Rehab your relationship with fat with the habit above. Change your mental models. Enjoy the fat of life.